To facilitate scaling up model plans, Robert Williams, Jr., Hazleton, Pa., draws scale grid on clear plastic, scores scratches, smears on black shoe polish, wipes off excess. Handy makeshift bench vise for holding sheet metal parts is actually a flat hinge, screwed to edge of work table. Screw in center tightens "jaws" on work, says C. M. Robertson, Ont., Canada. 30 lb. monofiliament fishing line cemented to leading edge of indoor glider wing before shaping makes tough reinforcement; serves as sanding guide. Idea by E. E. Wolfe, Elk Grove Village, Illinois. North Miami Beach, Fla., modeler, Bob Whitney, sends neat deal for rat racer automatic rudder tab. Rubber tension holds offset at low speed; centrifugal force on weight straightens tab later. Harry Murphy, Jr., Anderson, Ind., makes precise on-the-field "wash-in" or "wash-out" wing adjustments by pinning or cementing lengths of TE stock to trailing edge of wing. Length determines effectiveness. Vernon Van Diver, Jr., Woolford, Md., puts Styrofoam to good use in model wing construction. Thin spruce cap spars are spaced with foam blocks for greatly increased rigidity and strength. Special hole-cutting tool devised by E. Ceisel, Northfield, Ill., is used to cut holes in ribs or formers of completed wing or fuselage. Cutting wire part can be bent to change diameter. Addition of wire hook to starting cord when used with bottle cap makes starting model engine quick and easy. Hook latches over trailing edge of prop. Submitted by Robert Moragne, Baker, Ore.
Got a new idea for construction. 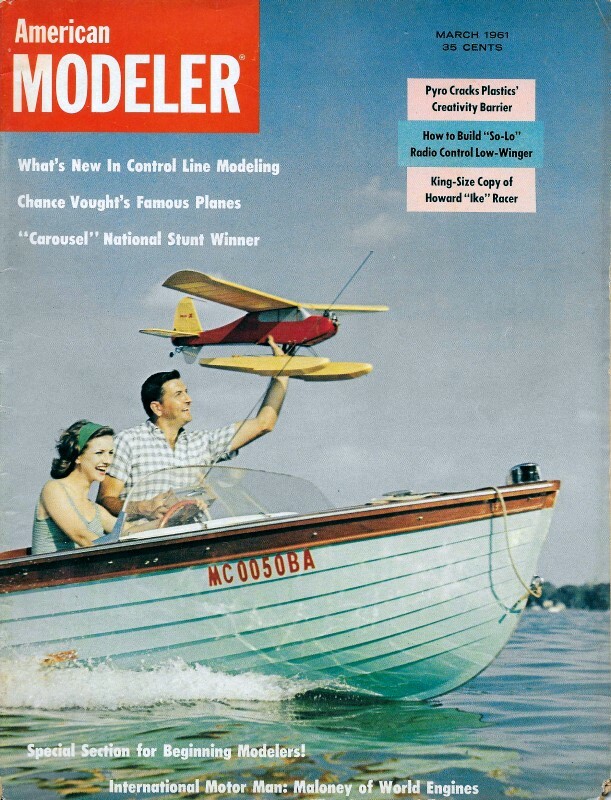 adjustment or operation of model planes, boats or R/C? "AM" pays $10 for each "hint & kink" used. Send rough sketch and description to Sketchbook, c/o American Modeler, 575 Madison Ave., New York 22, N. Y. Please note that because of the very large number of submissions, none can be returned to the sender.